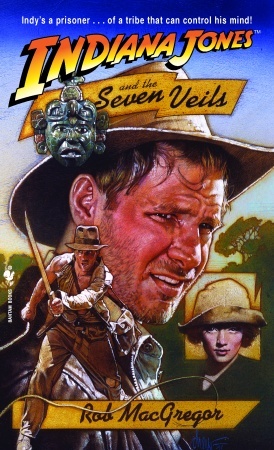 I just started reading “Indiana Jones and the Seven Veils“, a novel by Rob MacGregor. Given my current work schedule and chasing around after my kids, I haven’t had a chance to see “Indiana Jones and the Kingdom of the Crystal Skull” yet. I’ve heard a lot of negative things about the new movie, so I decided to tide myself over with some of the novels that I’ve heard are good. My friend Patrick recommended the Rob MacGregor novels. I’m only about a quarter of the way through the book, but I’m really enjoying it. It takes place after the Young Indiana Jones Chronicles, before the movies, and has a really high adventure feeling to it. Lost ruins, booby traps, things going wrong for Indy, a beautiful girl, almost losing his hat… y’know the fun bits of Indiana Jones! I started with this book, even though it’s MacGregor’s third Indy novel. I couldn’t find his first two Indy novels the day I went shopping, and this one is MacGregor’s favorite. Assuming I enjoy this book the whole way through, I’ll sure I’ll go back and get the previous novels. And on a somewhat related note, if you haven’t read the Indiana Jones lyrics, you’ve got to check them out! Too funny!